Newly appointed dean Scott Miller ushered in the academic year noting faculty awards, professorships, lectureships, and a vision of and for the college at the 2015 college session of BYU’s Annual University Conference. PROVO, Utah (Aug. 26, 2015)—Christ was not performing a miracle to astound or convert His disciples when He told Peter to cast his line for a fish containing a coin to pay tribute tax. According to Dean Scott Miller, He was making a point in Peter’s own occupational language. 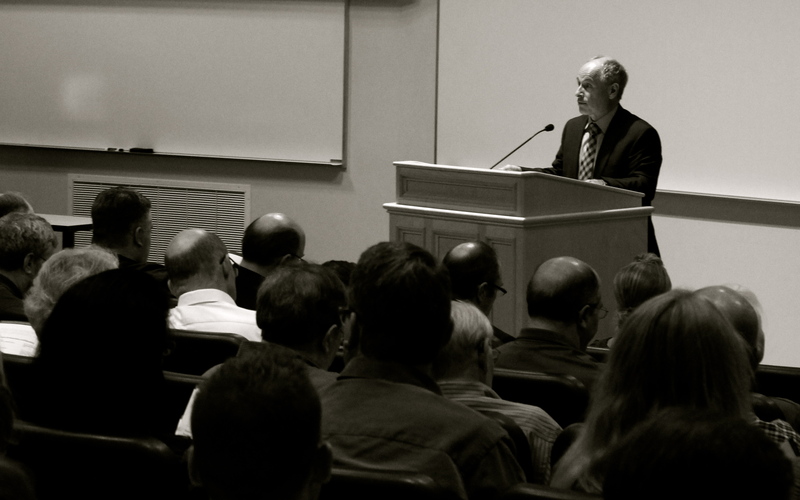 At the Humanities College session of BYU’s Annual University Conference, in his speech Miller said he believes faculty, too, are given the opportunity to see the hand of God in their occupations when they cast their own lines in faith and witness miracles. Associate Dean Frank Christianson emphasized the role of Humanities+ within the college’s culture and the need to continue assisting students to use their skills in professional contexts. Associate Dean Ray Clifford highlighted accomplishments in the college from the 2014-2015 academic year, including over 1,000 language certificates issued in 120 different programs and ACTFL (a major national language organization) contracting with BYU to develop tests of language reading and listening proficiency. To conclude the conference, Dean Miller encouraged faculty to view students’ backgrounds in service, leadership and language as one of the college’s greatest assets—an asset that should be leveraged in professors’ curriculum. Miller hopes faculty will show students a more liberating vision in the way they teach, write their publications, and share their faith.